Visitors come from the countries, United Kingdom, Canada, United States, Denmark, New Zealand & Costa Rica. Topics: Live-help, Betting Rewards Programs, Bookmaker Sportsbook, Bookmaker Racebook, Bookmaker Casino, & Bookmaker Poker. 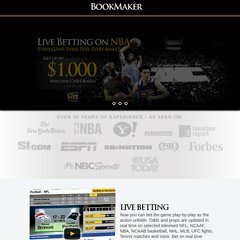 bookmaker.eu Football Betting Odds for NFL and College Games, Sportsbook ..
On average 4.00 pages are viewed each, by the estimated 5,803 daily visitors. Its 3 nameservers are dns1.idp365.net, dns2.idp365.net, & dns3.idp365.net. It is hosted by Betcris (San Jose, Curridabat,) using nginx web server. Bookmaker.eu's server IP number is 190.7.195.14. Its average load time is 2145 milliseconds, which is slower than 69% of websites globally.